Hier finden Waagen-Sammler Links zum Thema Waagen sammeln. 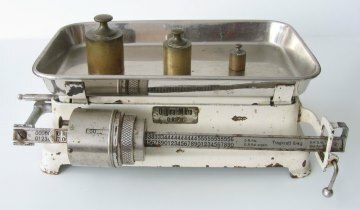 Scales & Weights - a collection of historical Scales and Weights from different periods of the past 3000 years. Gegliedert ist diese Homepage zunächst nach Waagen und zum anderen nach Gewichten. Viele interessante Informationen werden durch ansprechende Abbildungen illustriert. Selbstverständlich kommen auch historische Aspekte nicht zu kurz. Eine Site, die auf jeden Fall zum längeren Verweilen einlädt. "At a flea-market a few years ago, I noticed a second-hand letter scale. To me the model was strange. I bought it acting on impulse. How old this small letter scale really is, I still don't know. In May 2000 I started actively collecting letter scales, especially old mechanical ones. Searching and surfing the internet, resulted in a continuously growing number of sources of information. More people appear to have this -harmless- collecting virus. Even, real societies of scale collectors do exist. The pages above, bring the information together and present my letter scale collection." Überaus interessante Site über historische Briefwaagen.